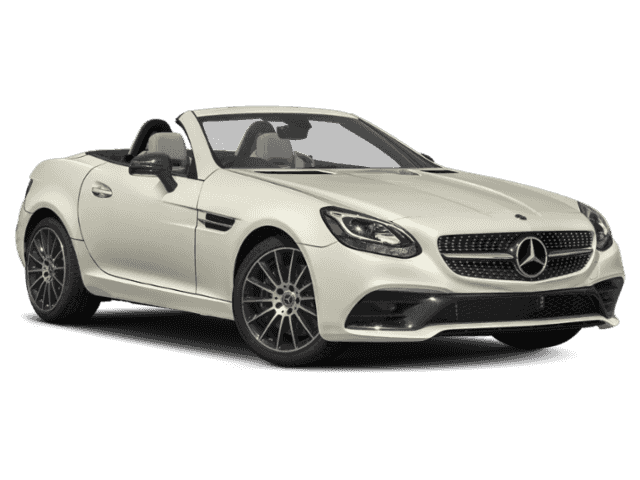 Contact Mercedes-Benz of Ontario today for information on dozens of vehicles like this 2019 Mercedes-Benz SLC SLC 300. This Mercedes-Benz includes: ANALOG CLOCK ON DASHTOPPREMIUM PACKAGEMulti-Zone A/C Keyless Start HD Radio A/C Climate Control Heated Front Seat(s) Satellite Radio Power Door Locks Keyless Entry Blind Spot Monitor HARMAN/KARDON Logic 7® SURROUND SOUND SYSTEMPremium Sound System AMG® LINE EXTERIORTransmission w/Dual Shift Mode Tires - Front Performance Aluminum Wheels Floor Mats Tires - Rear Performance BURL WALNUT WOOD TRIMWoodgrain Interior Trim SMARTPHONE INTEGRATION PACKAGESmart Device Integration WHEELS: 18 AMG® MULTI-SPOKETires - Front Performance Aluminum Wheels Tires - Rear Performance *Note - For third party subscriptions or services, please contact the dealer for more information. * This sporty Mercedes-Benz SLC convertible leads the class in performance and refinement. Pull up in the vehicle and the valet will want to parked on the front row. This Mercedes-Benz SLC is the vehicle others dream to own. Don't miss your chance to make it your new ride.There is no reason why you shouldn't buy this Mercedes-Benz SLC SLC 300. It is incomparable for the price and quality. Contact Mercedes-Benz of Ontario today for information on dozens of vehicles like this 2019 Mercedes-Benz SLC SLC 300. This Mercedes-Benz includes: NIGHT PACKAGETires - Front Performance Aluminum Wheels Tires - Rear Performance BLACK ASH WOOD TRIMWoodgrain Interior Trim ANALOG CLOCK ON DASHTOPPREMIUM PACKAGEMulti-Zone A/C Keyless Start HD Radio A/C Climate Control Heated Front Seat(s) Satellite Radio Power Door Locks Keyless Entry Blind Spot Monitor HARMAN/KARDON Logic 7® SURROUND SOUND SYSTEMPremium Sound System AMG® LINE EXTERIORTransmission w/Dual Shift Mode Tires - Front Performance Aluminum Wheels Floor Mats Tires - Rear Performance SMARTPHONE INTEGRATION PACKAGESmart Device Integration REAR DECK SPOILER (PIO)Rear Spoiler *Note - For third party subscriptions or services, please contact the dealer for more information. * Those shopping for a sporty convertible would be wise to check out this Mercedes-Benz SLC SLC 300. With the versatility to easily switch between open-air and closed-cabin driving, it's hard to ignore the everyday practicality of this SLC. You deserve a vehicle designed for higher expectations. This Mercedes-Benz SLC delivers with a luxurious, well-appointed interior and world-class engineering.The look is unmistakably Mercedes-Benz, the smooth contours and cutting-edge technology of this Mercedes-Benz SLC SLC 300 will definitely turn heads. This 2019 Mercedes-Benz SLC SLC 300 is proudly offered by Mercedes-Benz of Ontario This Mercedes-Benz includes: NIGHT PACKAGETires - Front Performance Aluminum Wheels Tires - Rear Performance ANALOG CLOCK ON DASHTOPPREMIUM PACKAGEMulti-Zone A/C Keyless Start HD Radio A/C Climate Control Heated Front Seat(s) Satellite Radio Power Door Locks Keyless Entry Blind Spot Monitor HARMAN/KARDON Logic 7® SURROUND SOUND SYSTEMPremium Sound System AMG® LINE EXTERIORTransmission w/Dual Shift Mode Tires - Front Performance Aluminum Wheels Floor Mats Tires - Rear Performance AMBIENT LIGHTINGSMARTPHONE INTEGRATION PACKAGESmart Device Integration *Note - For third party subscriptions or services, please contact the dealer for more information. * Those shopping for a sporty convertible would be wise to check out this Mercedes-Benz SLC SLC 300. With the versatility to easily switch between open-air and closed-cabin driving, it's hard to ignore the everyday practicality of this SLC. You appreciate the finer things in life, the vehicle you drive should not be the exception. Style, performance, sophistication is in a class of its own with this stunning Mercedes-Benz SLC.The look is unmistakably Mercedes-Benz, the smooth contours and cutting-edge technology of this Mercedes-Benz SLC SLC 300 will definitely turn heads. This outstanding example of a 2019 Mercedes-Benz SLC SLC 300 is offered by Mercedes-Benz of Ontario. This Mercedes-Benz includes: NIGHT PACKAGETires - Front Performance Aluminum Wheels Tires - Rear Performance BLACK ASH WOOD TRIMWoodgrain Interior Trim ANALOG CLOCK ON DASHTOPPREMIUM PACKAGEMulti-Zone A/C Keyless Start HD Radio A/C Climate Control Heated Front Seat(s) Satellite Radio Power Door Locks Keyless Entry Blind Spot Monitor HARMAN/KARDON Logic 7® SURROUND SOUND SYSTEMPremium Sound System AMG® LINE EXTERIORTransmission w/Dual Shift Mode Tires - Front Performance Aluminum Wheels Floor Mats Tires - Rear Performance SMARTPHONE INTEGRATION PACKAGESmart Device Integration REAR DECK SPOILER (PIO)Rear Spoiler *Note - For third party subscriptions or services, please contact the dealer for more information. * This sporty Mercedes-Benz SLC convertible leads the class in performance and refinement. You appreciate the finer things in life, the vehicle you drive should not be the exception. Style, performance, sophistication is in a class of its own with this stunning Mercedes-Benz SLC.There is no reason why you shouldn't buy this Mercedes-Benz SLC SLC 300. It is incomparable for the price and quality. Contact Mercedes-Benz of Ontario today for information on dozens of vehicles like this 2019 Mercedes-Benz SLC SLC 300. This Mercedes-Benz includes: ANALOG CLOCK ON DASHTOPPREMIUM PACKAGEMulti-Zone A/C Keyless Start HD Radio A/C Climate Control Heated Front Seat(s) Satellite Radio Power Door Locks Keyless Entry Blind Spot Monitor HARMAN/KARDON Logic 7® SURROUND SOUND SYSTEMPremium Sound System AMG® LINE EXTERIORTransmission w/Dual Shift Mode Tires - Front Performance Aluminum Wheels Floor Mats Tires - Rear Performance MULTIMEDIA PACKAGESmart Device Integration HD Radio Navigation System AM/FM Stereo Hard Disk Drive Media Storage MP3 Player BURL WALNUT WOOD TRIMWoodgrain Interior Trim WHEELS: 18 AMG® MULTI-SPOKETires - Front Performance Aluminum Wheels Tires - Rear Performance *Note - For third party subscriptions or services, please contact the dealer for more information. * You'll see the world in a whole new light when you slip behind the wheel of this impressive 2019 Mercedes-Benz SLC convertible. You appreciate the finer things in life, the vehicle you drive should not be the exception. Style, performance, sophistication is in a class of its own with this stunning Mercedes-Benz SLC.Put away your phone and focus on the road, your new vehicle has navigation.